Funmoods Web Search by Volonet Ltd - Boost Your PC. What is Funmoods Web Search? Installs a Mindspark toolbar in your Web browser that collects and stores information about your web browsing habits and sends this information to Mindspark so they can suggest services or provide ads via the toolbar. Download Boost and enjoy your PC. Remove Funmoods Web Search from your PC. Why should I uninstall Funmoods Web Search? 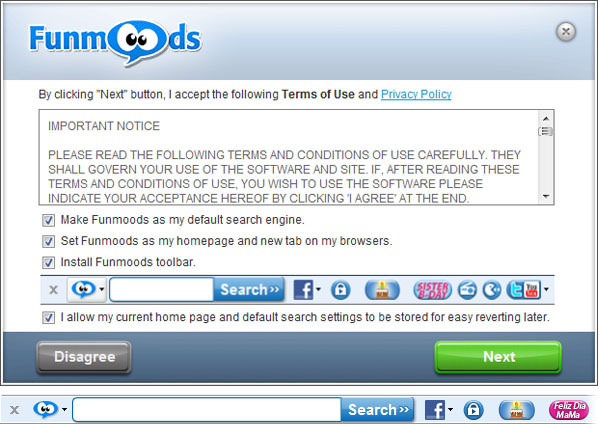 FunMoods toolbar gives no or little satisfaction to its users, but a profound desire to get rid of FunMoods browser extension is in place. The toolbar is but a part of the problem as occasional but inevitable redirects in the course of browser search leading to the toolbar related website burden users even more. To the right of the list item, click the Uninstall button and Boost will completely remove Funmoods Web Search from your PC. Use Add/Remove Programs control panel in Windows makes to uninstall Funmoods Web Search. Follow the appropriate instructions below to use this control panel. Select Funmoods Web Search from the list of programs, and click Uninstall. Alternatively, right-click the program and select Uninstall. Select Funmoods Web Search from the program list, and click Uninstall. Alternatively, right-click the program and select Uninstall. Select Funmoods Web Search from the list of programs and click Remove. Boost helps you remove Funmoods Web Search by Volonet Ltd and clean your PC.